General Membership Meeting will be on Thursday, February 14th at Atonement Lutheran Church. When the Going Gets Tough, the Tough Get Quilting”. 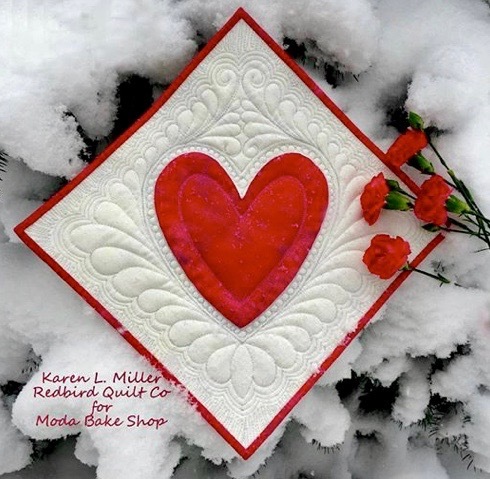 Marie lives in the Bend Oregon area and has been a quilter and writer most of her life. She has written numerous books and started writing when she was a girl beginning with love stories featuring lots of handsome princes in fast cars and included extensive descriptions of the heroine’s wardrobe. In high school she began writing short stories and later novels. Her Cobbled Court“series has gained a dedicated following among quilters as well as those who’ve never threaded a needle and don’t plan to try. She and her husband, Brad, have raised three sons and due to his career, have moved numerous times. She has kept quite busy working in a variety of paid and volunteer jobs and making time for hobbies like quilting, cooking and reading … always reading. If you signed up for the Mug Rug block of the month which provides an introduction to “paperless” paper piecing, please be sure to come to the meeting a half hour early. I will be teaching the procedure in the classroom to the left of the restroom beginning promptly at NOON. You will receive your pattern packet there. Because space is limited, you must have signed up for the block in order to attend the class. Be on the lookout for other technique opportunities from Block of the Month to increase your skills and enjoyment in quilting. Please bring your 2020 Raffle Quilt ideas so that they can be voted on at the meeting. If you are planning on attending the General Meeting could you please bring the project(s) you worked on at the Retreat for Show & Share? I don’t want the rest of the members thinking all we do at the Retreat is have fun, laugh & have enjoy Happy Hour! If you can’t make it to the guild meetings but have finished quilts that you’d like everyone to see, please email a photo to Lee Palmer. She’ll add them to the Show and Share page. We are out of our Oncology Bags, as I delivered the last group this week. This is an ongoing need, so please keep sewing up these little items. I am told that the chemo patients really enjoy picking through the selections, so please make them out of fun and happy prints, both male and female oriented prints. Remember that we are now being asked to make them also for the Cardiology Dept to hold heart monitors, and they have asked for bags with a closure such as button and hole, velcro, etc. The directions for the oncology bag will be posted to the website on Thursday morning. We also have an ongoing need for those burp cloths, so please keep them coming also. I will have patterns available at our table at guild. Regarding quilts, are greatest need are those in the 4X5 size range, with kids’ prints, both boys and girls, These are for Head Start, and they use them when they take a nap. Since they are on the floor, it’s probably best to make them out of quilter’s cotton, and not flannel, although we have given them flannel also. The quilts get washed frequently and get a lot of use. Thanks ladies for your continued support of Community Quilters! Quilt Documentation has been rescheduled for February 23, 9:00 to 3:00 at the Carriage House in Newport. Brand New Babylock Soprano BLMSP for sale!! Pivot feature, where the foot pops up when you stop so you can easily insert your next piece. Push Buttons for lowering the pressure foot, needle up/down, thread cutting, reverse stitch and locking stitch.